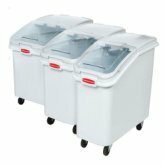 Keep food products fresh and organized using our wide selection of food containers, perfect for storage in refrigerators and freezers or dry storage! Though they come in different sizes, they also feature measurement labels on their outside, to pre-measure liquids and ingredients as needed. Labels available to accurately rotate ingredients, perfect to reduce waste. 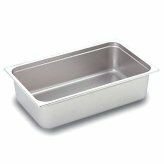 Various sizes of food and steam table pans available, in both stainless steel and plastic, from Winco, Rubbermaid and Cambro. A colour-coded and organized storage system is a must have for any food establishment, to ensure that no food products go to waste, and that you can always find exactly what you are looking for, when you need it! Looking for a more attractive way to store spices and small ingredients? Check out our air-tight glass jars!